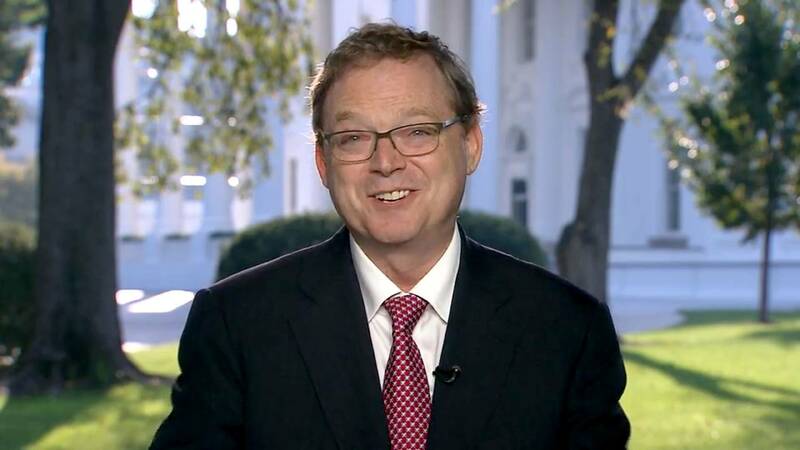 Trump: 'I don't believe it"
(CNN) - White House economic adviser Kevin Hassett said Friday that he believes climate change could threaten economic growth. It's a position that puts him at odds with the Trump administration and the President himself, who has openly questioned whether the climate is warming at all. "It's something people should take seriously and think about," Hassett said in an interview with CNN's Poppy Harlow. Hassett, an economist long involved in conventional Republican political circles, has in the past expressed support for instituting carbon taxes to curb pollution. "I was one of the first economists writing theoretical papers about carbon taxes," he said on Friday. "It's literature I have been involved in for a really long time." Last year, a 1,600-page report on the potential effects of climate change written by scientists from 13 different government agencies estimated that climate change could result in the American economy losing hundreds of billions of dollars, or, at worst, more than 10% of its GDP by 2100. "I don't believe it," Trump said after the report's release. Hassett declined to estimate the economic impact of a sweeping climate change proposal by freshman Democratic Rep. Alexandria Ocasio-Cortez which would involve, among other progressive bucket list items, a massive effort to limit pollution, a federal jobs guarantee, and an infrastructure overhaul. "I haven't modeled the Green New Deal," Hassett told CNN. "I'm geeky enough that I'll tell you what the effects are with precision once I model it." His comments came after Larry Kudlow, director of Trump's National Economic Council, said at the Conservative Political Action Conference in National Harbor, Maryland, on Thursday that Ocasio-Cortez's plan would "literally destroy the economy." "We'll probably lose 10 to 15% of our GDP. It's remarkable," Kudlow said. Hassett cited Yale University economist William Nordhaus, a Nobel laureate who is known for his economic modeling on climate change. "Yes. I think Nordhaus's work is food for thought about what could happen," Hassett told CNN. "I think that Nordhaus was right to get the Nobel Prize for his work, and that it's basically something everybody should pay attention to as they think about future policy risks."